Assume that a soldier was carried as a sergeant on the rolls of Colonel Campbell’s Company, 13th Virginia Regiment, on a company muster roll dated 5 April 1779 at Fort Pitt. If you were entering this into your genealogy database software, and had to include a state as part of the location description, which state would you list? Now, everybody knows that Fort Pitt was right in the area where the City of Pittsburgh sits today, at the forks of the Ohio River, where the Allegheny and Monongahela Rivers converge2 — the city where The Legal Genealogist will be headed tomorrow for the 2015 Conference of the North Hills Genealogists. But before you roll your eyes at the question… stop and think for a minute. Because it wasn’t so clear in 1778 and 1779 just what state would end up with the area where Fort Pitt stood. So… service at Fort Pitt, 1778-1779? Or maybe just Fort Pitt, somewhere. 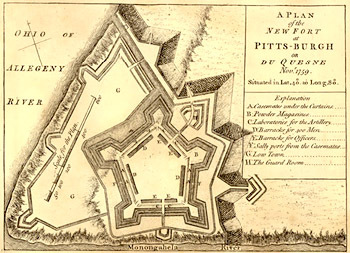 Image: “A Plan of the New Fort at Pitts-Burgh,” John Rocque (1759), via “Wikimedia Commons”. Good story, well told. And to think that some folks believe this sort of thing never happened before. History is just plain fascinating for what it tells us about ourselves. Pretty soon I will need to expand my history sleuthing, and I think you just gave me a push-start! So where was the line separating the claims of Connecticut from those of Virginia and Pennsylvania? So glad to hear you’re coming to Pittsburgh! We love our city – hope you have a great time during your visit. What is now Illinois was considered to be Virginia at the time of the Revolution. Genealogy forces us to learn history! Then, of course, West Virginia split off from Virginia, but that’s another story, too. Fort Pitt on the frontier? 🙂 Maybe some other places would need this same location.